The harvest moon is the full moon closest to the Autumn equinox (22 September). It would have been an amazing sight to behold last night if it hadn’t been so cloudy on the way home from Harvest Festival! Across the UK and Ireland, the harvest has been precarious this year, I have never seen so much hay being made in September before. We started to panic as our spring barley wilted in the boggy fields and considered converting a hovercraft as a makeshift combine! Thank you to all who did sun dances as we finally had a full dry week and the combine arrived. Our yield was not too bad at 2 tonne per acre, could have been much worse so we consider ourselves very lucky. Although apple harvest is poor this year, we have managed to source additional cider apples so rest assured, 150 gallons of cider is set to be made on our cider course. I have managed to hide some of last year’s cider from Jim for sampling purposes! 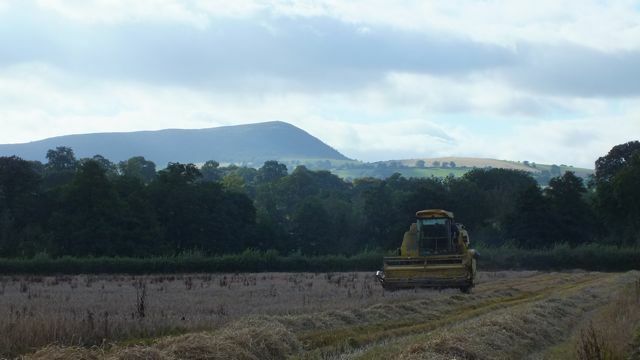 August is primetime for agricultural shows and with so many being cancelled due to the weather, we were fortunate to have sunshine for both Llangynidr and Monmouthshire Show and Usk Show in September. Congratulations to Craig who won our “Guess the Poo” competition resulting in a free course! Livestock update – So far in September we have had 4 calves born with more on the way. Our gilts have been visited by “Dave” a rather fetching and very well mannered Pietrain boar so hopefully piglets soon (watch this space). Dave was very reluctant to leave, probably due to the wallow, trees and fresh spring water running throught the pig enclosure! Jim’s turkeys are growing fast and seem to have taken a liking to the trampoline which happens to be in their enclosure! Lambing time is creeping up on us and sheep husbandry, as always, is really important. Especially feet! Alongside foot trimming, dagging, tagging, handling and health checking on our Sheep Husbandry course last week, students also raddled the tups and put them in with the ewes. The speed at which the tups worked was truly eye opening!…. The competition came in useful on our Wildlife Identification Skills course where students also learned how to identify mammals, birds, trees, plants, reptiles and much more……. I’m sure one of the highlights was finding fresh otter spraint which smells of jasmine tea!! 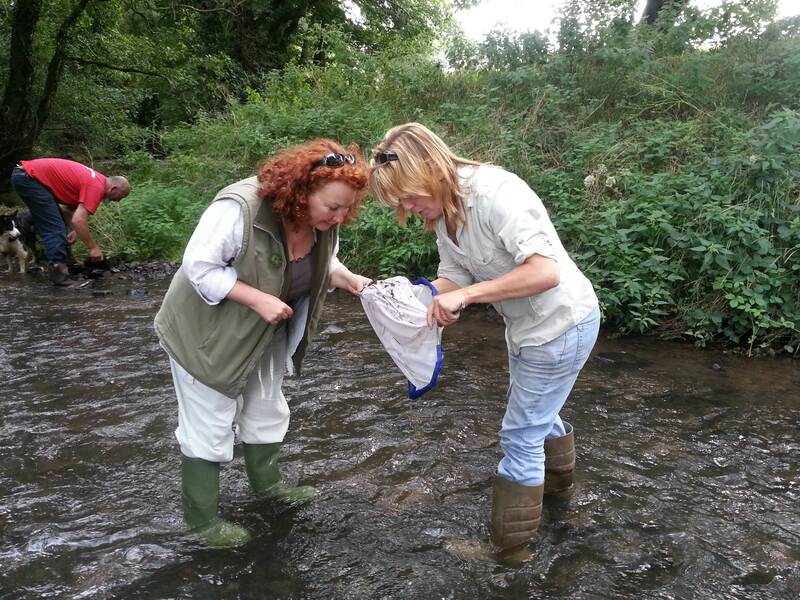 We undertook water sampling on our brook and the invertebrates found indicated extremely good water quality. Checking out the freshwater invertebrates. Wildlife and farming is a natural combination. Cattle, badgers and bovine tuberculosis (bTB) is a subject currently being hotly debated. I have spent my life working with animals and have been actively involved in wildlife rehabilitation (including badgers) since I was a child. I am also a farmer and so have seen the devastating effects, both emotionally and financially that bTB in cattle can cause. The fact is that if nothing is done, bTB is going to continue to increase in both badger and cattle populations. Vaccination remains an essential tool in combatting this disease but has it’s own limitations. Vaccines are only effective on healthy, bTB free badgers. There is no benefit to badgers if they are already infected. Farmers do want to see healthy cattle and healthy badgers co-existing without the threat of bTB. We have regular bTB tests on our own farm as do all farmers across the UK. Biosecurity is paramount on farms and although it is difficult to prevent badger-cattle contact, emphasis needs to be on secure food stores and where practical, raised feeding troughs. Good husbandry will promote raised immunity in stock. With most farmers already having this in place alongside regular testing, it has to be understood that financial and emotional stress from bTB results in frustration when nothing is done about the bTB in wildlife populations. For a blanket cull to be effective, it has to be of a sufficient scale with full participation. I cannot see this working for many reasons. Is the ideal then to euthanase diseased setts and vaccinate healthy ones? Work is ongoing to perfect the PCR (Polymerase Chain Reaction) faeces test to enable us to do this. Work is also moving on to enable us to use the oral vaccination which will enable all landowners to vaccinate healthy setts. As far as cattle vaccinations go, it is currently illegal to use them in the EC. As far as I am aware, non-sensitising cattle vaccines are a few years off and though efforts are being made to rectify this situation, farmers cannot vaccinate their cattle at the present time. These additional tools are not available for use as yet but in the mean time I hope all parties concerned can start communicating and working with each other, use the tools we have at present and take steps towards a solution. Surely we all have the same aim, to have healthy, bTB free, badgers and cattle.